NEW: Highly-Efficient PP-KTP Crystals. Periodically-poled KTP crystals with very high efficiency are immediately available for delivery from stock! Frequency doublers: 976 nm to 488 nm and 1064 nm to 532 nm. Standard dimensions: Aperture:1x2.5 mm² (HxW), Length: 10 mm, AR-coated. Large quantities of the mostly used NONLINEAR crystals like LBO, BBO, BiBO and KTP are available from stock. Other nonlinear crystals are available with short delivery times. Customer-specific crystal cuts and coatings are also available. The nonlinear crystals are synthesized from highly purified materials and are subject to stringent quality control. Most advanced coating processes like IBS (Ion Beam Sputtering) and IAD (Ion-Assisted Deposition) provide high-damage threshold and extremely low residual reflection (e.g. < 0.05% at 1064 nm) for most demanding intracavity and extracavity applications. 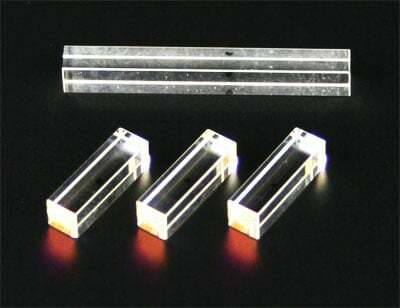 Crystals with apertures ranging from 2x2 mm to 6x6 mm and lengths from 3 mm to 30 mm, cut for frequency doubling or tripling of the mostly used laser wavelengths or parametric generation are available for prompt delivery. Please contact us for your immediate needs.